It’s been another good year for us. We have doubled our top tier rankings in this year’s Legal 500 thanks to our “second to none” service. Our partner-led firm, places clients and people in the centre of our priorities, has climbed the rankings over the years thanks to our continued commitment to the region. This year has seen an increase in our top tier rankings from three to six, gaining first tier in the banking and finance, commercial property and education sectors whilst retaining previous top tier positions in sport, charities and not-for-profit, and debt recovery. We are also one of a small number of firms to be nominated by Legal 500 for the Regional Firm of the Year for Real Estate. Stephen McNicol, our Managing Partner, attributed the firm’s success to a focused strategy which puts the North East community at the heart of its aims and objectives. He said: “These positive results show that we continue to have a strong influence regionally. We are a single office firm with solid roots in the region and we have been working to a long-term, concerted strategy that centres around organisations based in the North East, which we have supplemented by selected national gains. “Whilst we have also experienced success at a national level, we are as committed as ever to small and medium-sized, owner managed businesses in our home market, many of which we have worked with for many years. “We will build upon these successes by doing what we do best; providing high levels of expertise and knowledge to clients, accompanied by our concerted approach to providing excellent service. This has helped our national reputation to grow with recent panel appointments including an exclusive two-year contract with England Athletics, London Universities Purchasing Consortium’s (LUPC) and the prestigious Sustainable Development Capital LLP (SDCL). Our Energy Team won its place on the SDCL panel by demonstrating its expertise across the energy efficiency, microgeneration and sustainable urban infrastructure sectors. There has also been a number of northern banking panel appointments throughout the year including Santander UK, Lloyds banking Group and Yorkshire Bank. This has been made possible by placing a strong emphasis on the development of our people. In October 2013, we became one of only very few businesses in the UK to achieve the Investors in People Gold accreditation. We are the only law firm with a North East head office to achieve this accolade and this reflects the support and encouragement invested in our people as part of the continued commitment to providing an excellent service to clients. Our clear understanding of clients’ needs has seen the firm continually strengthen the quality of its people throughout the year through a number of key promotions and recruitments. George Festing joined as a Partner specialising in intellectual property disputes and, most recently, Russell Hall joined as a partner specialising in working with registered providers. Internally, Phil Clare was promoted to a partner in the Corporate Team. This commitment to excellence within our firm is mirrored in the ongoing Corporate Social Responsibility (CSR) programme in and around the region. CSR has always played a vital role in the firm’s culture and its people are actively encouraged to regularly volunteer their time to the local communities in which they live and work. In addition, the firm continues to contribute a sum equal to 1% of its annual profits to a charitable fund which supports causes that are close to the hearts of people in the business. Our team was acknowledged earlier this year when we won the Heart of the Community Award for the Tyneside and Northumberland regions at the North East Business Awards – the third year in a row we have won. 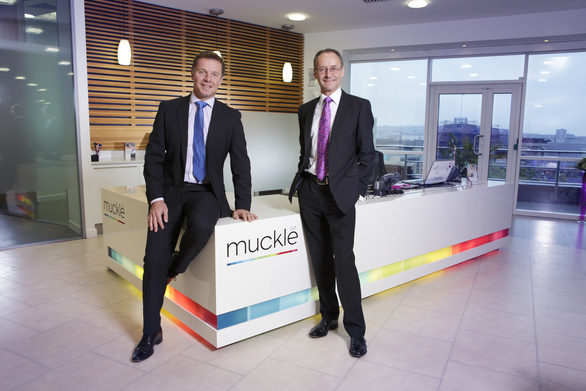 Hugh Welch, our Senior Partner, said: “The North East is our heartland and everyone at Muckle LLP is committed to supporting the region whether that be through the legal advice we provide, our people who we invest in, our charitable work within communities or our thought leadership events. For more information, help or advice please contact Stephen McNicol on 0191 211 7904.